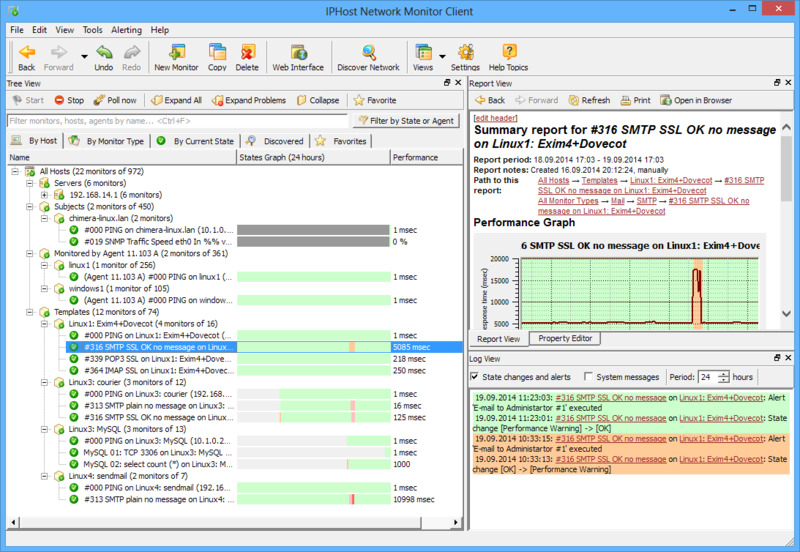 PHost Network Monitor is a distributed network and server monitoring software. This tool allows monitoring of websites and intranet applications, mail, database (Oracle, MySQL, MS SQL, ODBC) and other servers, network bandwidth and equipment, other resources inside and outside your network. Remote Network Agents enable monitoring of resources in multiple separate networks. Performance and other counters on Windows computers can be monitored via WMI, on UNIX/Linux systems via SNMP. Supported protocols are HTTP, HTTPS, FTP, SMTP, POP3, IMAP, ODBC, PING, and more. Web Transaction monitor for end-to-end web applications and e-commerce sites monitoring. SNMP MIB browser with SNMP SET support. SNMP traps monitor for immediate alerts on event. You can also use any Nagios plugin to monitor what you need with IPHost Network Monitor. Alerts by email, SMS, Jabber, ICQ, AOL, SNMP SET, play sound or by execution of a program. Administrator tools provided. Daily, weekly, monthly automatic reports (summary, trend, problem) for any monitor, host or group. Reports for custom period and visual alerts in web interface. Traffic monitors are no longer forcefully re-added for (re)discovery in client GUI. This will be done once when you upgrade to a version where support for traffic monitors was added, or install such a version anew. It is possible to disable (re)discovery of such monitors afterwards.